Iran announced Saturday that it downed and captured another "enemy drone," the semi-official Fars News Agency reported. 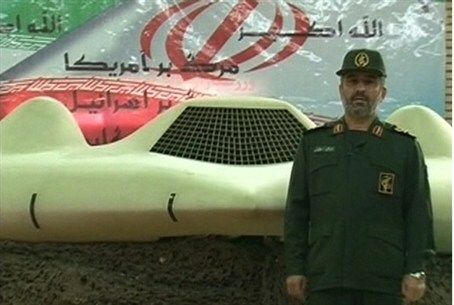 "IRGC's electronic warfare systems detected electronic signals, which indicated that foreign drones intended to enter our country," said Islamic Revolutionary Guards Corps Lt. Gen. Hamid Sarkheili, according to Fars, adding that Iran may release film of the drone. "Our specialist forces then succeeded in bringing down the drone in the field of maneuvers," he added. Earlier this month, the regime claimed that it had decoded and released footage from a U.S. drone that it downed over a year ago. The black and white aerial footage, which Iran claims was from a RQ-170 spy plane, was aired by Iranian news agencies and distributed via YouTube. The drone was reportedly downed on December 4, 2011, near Kashmar in the country's northeast, some 225 kilometers (140 miles) from the border with Afghanistan. "We've asked for it back. We'll see how the Iranians respond," Obama said at the time. Iran, however, refused to comply and instead released photos of Iranian officials studying the aircraft. Over the past few months, Iran has claimed it has captured several American drones after they entered Iranian airspace over the Persian Gulf, as tensions between the two countries continue to escalate over Tehran’s nuclear program.